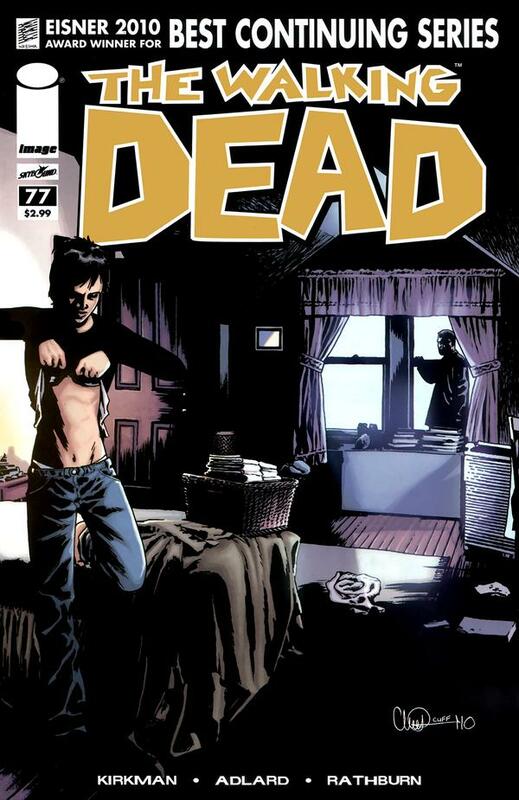 The story starts off as Rick is on the phone again with his dead wife and Carl walks in. One more thing what makes this even more strange is the phone is unplugged. Carl on the other hand, is starting to get frustrated with his father. As the story continues things have taken a turn for the worse for Scott, the man that has been dying from an infection bites the dust and the group are forced to put a pic to his head before he becomes a zombie. Heath Scott's best friend is asking for a funerial while the others just want to bury him in a shallow garve and move on with there liives and remember Scott for who he was. Pete the Doctor that gotten into a fight with Rick over him beating his wife and son just loses it, and starts slicing and dicing and one of those people that he slices in the neck were Regina. As Rick points the gun on Pete he gets the word to pull the trigger. Pete is toast. Meanwhile the Zombies hear the gun shot and seem like they are going to make there way to the community. Also another small group of people heard the gun shot and seem like they are heading there also. On a positive note Andrea finds companionship with a coworker named Spencer while Maggie and Glenn seem to be reconecting there relationship.